The reason friction is so feared online is the opportunity it creates for distraction. A customer might have ten other tabs open while they’re on your checkout page. If you move them through your page efficiently, there’s a good chance they will complete the purchase. If, on the other hand, you get greedy and ask for more information than you really need, they might just decide one of the options on another tab was less hassle. Sale lost! The dynamic can be very different in the physical world. The right amount of friction and/or distraction at the right time can improve customer experience (CX) significantly. A great example of how friction improves CX outside of bits and pixels is the use of mirrors in elevators. 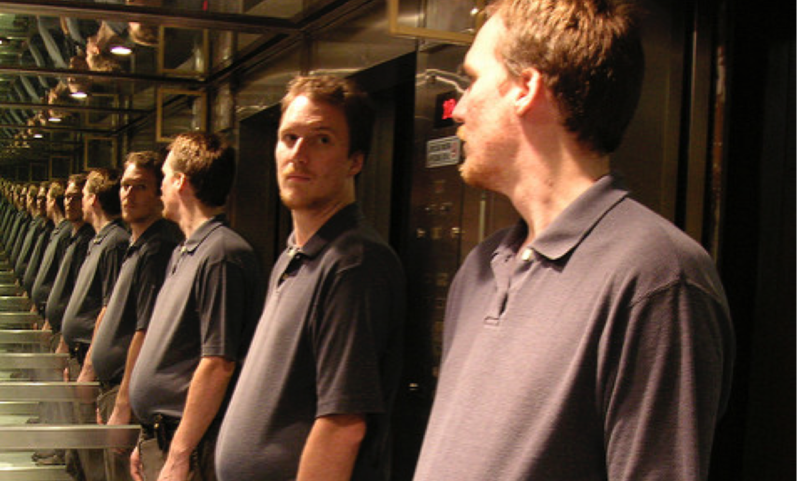 Nearly every elevator in the world has a mirror on one or more of the walls. I always assumed this was to combat claustrophobia and make the elevator seem more spacious, but that was not the original motivation. The original reason to include mirrors in lifts dates back to mid 20th century when buildings were getting taller but elevators weren’t getting any faster. The technology simply didn’t exist to propel elevators up and down a lift shaft at great speed while maintaining a high level of safety. The brilliant solution was to distract people during the journey between floors. There are very few of us who can resist a little self-admiration when the opportunity arises. Tests found that lift users stopped thinking about how long the elevator was taking and started thinking about how great they looked. Perceived journey times dropped and CX improved significantly, simply because of the distraction. This tactic is already employed at millions of checkout tills across the world. The primary intention of displaying sweet treats on the shelves beside the checkout queue is to tempt you to part with that extra bit of cash. But it also serves to distract you from the fact that you’re waiting in line to hand money to that business. Instead of thinking that you’re never coming back to the store again, you’re thinking about how many points a bar of chocolate knocks off your diet plan for the day. One of the most frustrating parts of table service in a restaurant is when the bill has been delivered and you’re ready to go, but the server doesn’t return with the credit card machine or with your change. This is the perfect time to create some friction. You could do lots of things, but I would recommend asking customers to fill out a quick feedback survey (full disclosure: I am the founder of ServiceDock, which is a customer experience management platform for multi-site businesses). This creates a win-win in terms of CX because you have distracted the customer, while also acquiring useful data to enhance CX. Sometimes making customers wait is expected and if you’re not making them wait you may be damaging CX. You may also be removing some of the high points of the customer’s experience by reducing the impact of emotions such as excitement and expectation. Such feelings play a central role in creating lasting memories. For example, getting your food order delivered to your table instantly is a worse experience than getting it later than expected. Getting it instantly conjures up images of a dish being reheated in a microwave or worse; a dish that has already been delivered to another table and been rejected. On the other hand, the 10 minutes waiting for a dish creates a heightened sense of anticipation and gives the diner an opportunity to get their juices flowing. Even in the most customer centric businesses, there are going to be times when demands on staff or facilities cause the customer journey to slow or even come to a standstill. Mapping out those journies so you learn where the bottle necks occur most frequently is the first step on the path to addressing them. The next step most businesses will focus on is how to eradicate the delay to prevent customer frustration building. That can be expensive because it will typically mean more staff, more overheads and less profit. If you are prepared to think outside the box, you can achieve more than simply remove the negative experience with a little friction; you can actually improve the overall customer experience with it. I would love to hear any ideas along these lines that you have implemented or are thinking about in the comments section below.